The Tiny Love Gymini Bouncer has been designed with babies in mind, putting two bars in arms reach for baby to grab at toys and to help with hand eye co-ordination. Its comes with adjustable activity arches for multiple positions, with sliding rings enable you to re position toys. 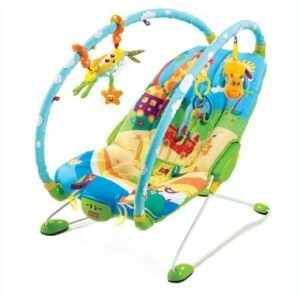 With open arch position for easy access and a soft and washable padded mat. The bouncer features lights and music toy.